New Orleans, LA – The delegates of the American Hellenic Educational Progressive Association (AHEPA), elected Phillip T. Frangos, East Lansing, Mich., as their supreme president at the 92nd Annual Supreme Convention, New Orleans, La. Frangos ran unopposed in elections that were held Friday, July 25, 2014. Formal installation ceremonies were held Saturday, July 26, 2014. “It is an honor and privilege to be elected AHEPA supreme president,” Supreme President Frangos said. “It is with humility that I undertake the responsibilities of this office. I thank those who have mentored me, supported me, inspired me, and tutored me over the many years that I have been a member of an organization which carries the torch of Hellenism. Frangos is a member of Wolverine Chapter 142, Lansing, Mich. He has served AHEPA in numerous leadership positions including most recently supreme vice president and all offices at the district and chapter levels. He also served as Chairman of the Board of Trustees in the mid-1980s. As supreme president, Frangos’s responsibilities include being the chief executive officer, and principal spokesperson, of the entire AHEPA domain, which includes the United States, Canada, and chapters in Europe. The 2014-15 Supreme Lodge is comprised of: Canadian President Kenneth N. Matziorinis, Supreme Vice President John Galanis, Supreme Secretary Andrew Zachariades, Supreme Treasurer Tom Gober, Supreme Counselor Gregory Stamos, Supreme Athletic Director Louis G. Atsaves, and Sons of Pericles National Advisor James Kokotas. The eight Supreme Governors are: Region I: Demetrios C. Kirkiles, Region II: Robert Stepp, Region III: Philip Vogis, Region IV: Frank P. Fotis, Region V: Costas Boutsikakis, Region VI: Nick Kavadas, Region VII: Timothy Joannides, and Region VIII: Robert Sexton. Elected to positions on the Board of Trustees were: Nicholas Karacostas and Vassos Chrysanthou. Karacostas, who is a past supreme president, was re-elected to his second term on the board. The organizations that comprise the AHEPA Family also held elections. Anna-Helene Grossomanides was elected Daughters of Penelope Grand President; Jimmy Googas, was elected Sons of Pericles Supreme President; and Deanna Socaris was elected Maids of Athena Grand President. Saturday’s Installation Ceremony of newly-elected officers officially concluded the 92nd AHEPA Supreme Convention, which began Monday, July 21. The 2015 Supreme Convention will convene in San Francisco, Calif.
On Friday night AHEPA honored excellence in the community during Grand Banquet, the pinnacle event of the Supreme Conventions. George Kalogridis, president, Walt Disney Parks and Resorts, as well as B’nai B’rith International were honored. George Kalogridis was presented with the AHEPA Socrates Award for excellence in his profession. The Socrates Award is the highest honor the AHEPA can bestow upon an individual. “I stand before you both as a son of America and a son of Greece,” he said in acceptance. Both recipients of the awards received standing ovations! Archbishop Demetrios of America was the Keynote Speaker. 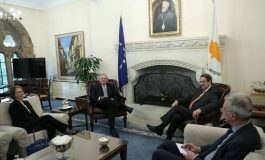 Remarks were also delivered from the Ambassador of Greece to the United States Christos Panagopoulos, Ambassador-Consul General of the Republic of Cyprus Vasilis Philippou, and Philip Christopher, president, International Coordinating Committee-Justice for Cyprus (PSEKA). The Ahepan of the Year and the AHEPA Lifetime Achievement Award were presented to Peter Marudas and Alex Booras, respectively. AHEPA National Housing President Angelo Kostarides announced charitable contributions of more than $360,000 to national and local community service and charitable organizations. And in remarks by Penelope Alefantis that clearly moved the audience (including myself to tears), the Sons of Pericles and Maids of Athena announced the Junior Orders raised $60,000 for research to find a cure to Friedreich’s Ataxia, a rare neuro-muscular disorder. Penelope suffers from this terrible rare disease. She is truly an inspiration to us all! Farewell remarks were offered from each of the AHEPA Family’s national leaders-AHEPA Supreme President Anthony Kouzounis, Daughters of Penelope Grand President Joanne Saltas, Sons of Pericles Supreme President John Ververis, and Maids of Athena Grand President Angela Armstrong. 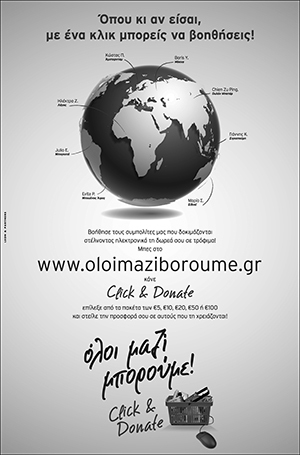 Supreme President Kouzounis did leave the AHEPAns with one final challenge-to raise funds for the rebuilding of the Saint Nicholas National Shrine at Ground Zero. Even before officially rolling out the fundraising drive, $3,000 was collected.